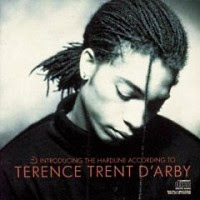 In 1987, Terrence Trent D'Arby released his debut album, Introducing the Hardline According to Terence Trent D'Arby. The album spawned two Top 5 hits. If Wikipedia is to be believed, that album sold over twelve million copies. He followed it up with the equally obnoxiously titled Neither Fish Nor Flesh: A Soundtrack of Love, Faith, Hope & Destruction. The album was critically acclaimed and some, like myself, preferred it over Hardline. The album sold 4 million copies but, like all his future releases, failed to chart any singles. But of all these facts and figures, the one I find hardest to believe is that D'Arby has released four albums since 2001. I was a big fan of his at one time, but without radio play or videos, I was totally unaware of any of these releases. Out of sight, out of mind. But as soon as I get some cash together, I'm going crazy on iTunes. Until then, here's Terrence Trent D'arby's only Number 1 single, "Wishing Well."